Three artists from the front rank of reggae singers - with extensive credits for such producers as Coxsone Dodd, Augustus Pablo and Glen Brown - whose work at Wackie's without question includes their very best. 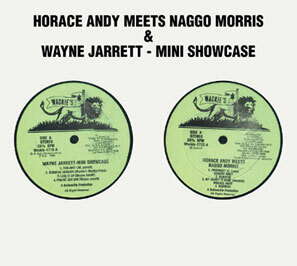 The two Horace Andy cuts nod to Studio One: an interpretation of Little Roy's Prophesy reworks Peanut Vendor with the bebop artfulness of the Sound Dimension; while My Heart Is Gone is a homage to the Ken Boothe classic. The under-recorded Naggo Morris - who replaced another Wackie's alumnus, Leroy Sibbles, in The Heptones - is best remembered for his Joe Gibbs 45, Su Su Pon Rasta: here his soulful baritone is in just such searing form, and the track You Rest On My Mind is devastating. 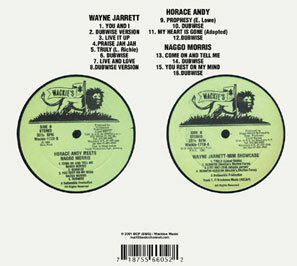 The opener on the second 10" likewise recasts a reggae evergreen for its rhythm, Keith and Tex' Tonight - but now the music (co-produced by Sugar Minott, either side of the Bubble Up album) is darker and more burnished, with Wayne Jarrett's Horace-styled falsetto set off against nyabinghi percussion. Also featured are the only reggae interpretation of Lionel Richie's Truly you need to hear, and a killer version of Don Carlos' Black Harmony. These 1983 releases revived by Rhythm and Sound present the singers showcase-style, in mostly devotional mood. The music is classical and original - full of awe, in a kind of dread development of the Bullwackies lovers rock sound - with inimitable and glorious dubs throughout.